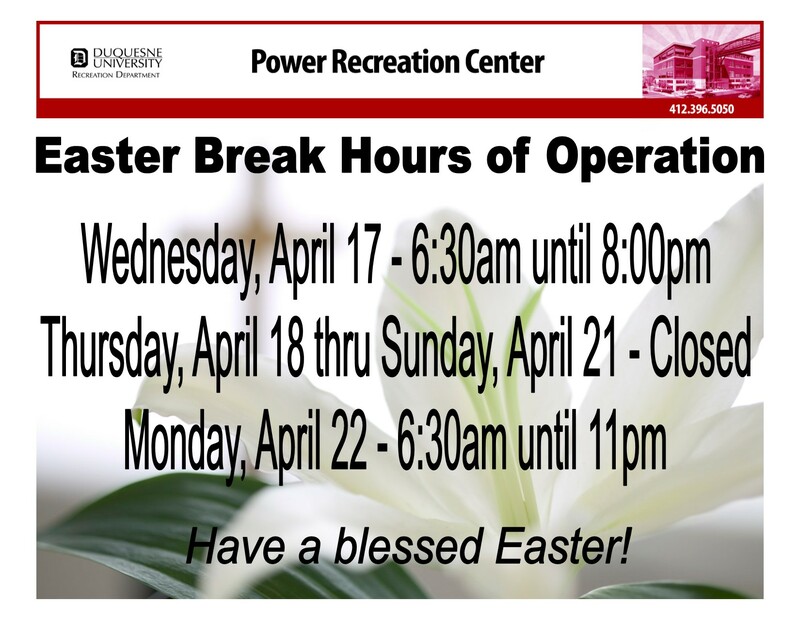 The Recreation Department is committed to ensuring that your Power Center experience is challenging, fun and inspiring. Enjoy our wide array of intramurals, group fitness classes and exceptional cardio and weight equipment. Contact us at 412.396.5050. Don't miss out, get involved now. Join the high energy atmosphere. Meet new friends, stay healthy and fit. Use state-of-the art facilities and equipment. Just swipe your DU Card; everything is free. *Elevator doors close 30 minutes prior to closing. *During official University holidays and breaks, facility may be closed or operate with limited hours Eligibility and Access. *All students, faculty, staff, and administrators currently enrolled or employed at Duquesne University MUST present a valid ID card in order to use the facility or participate in any of the recreation events or activities. We would love to give you a tour of our facility. Please call us at 412.396.5050 to set up an appointment or simply stop by during our hours of operation.